Most of us were forced into wearing eyeglasses when we were kids, and for many, this was not a pleasant experience. If you were the kid with glasses, I am sure you remember the constant urge to take them off or the secret wish that they just disappear. The eyesight needs to be checked regularly and a higher number is prescribed after every evaluation. The question here is, does wearing glasses make your eyes worse or are there other reasons for the need of a higher number? Of course not. It is true that a higher number is needed after a few months or years but that does not mean that the glasses are to be blamed for worsening eyesight. When you wear glasses you can see crystal clear, but if you take them off everything is blurred and unclear. This difference in vision is appreciated by everyone wearing glasses for a very long time. The world does not look the same if they are not wearing the glasses. If you are thinking that the glasses are making your eyes weaker than before, think again, because this is not true. Just imagine how things looked like before you started wearing glasses, the blurred edges, the dull colors, and all the effort of squinting and staring for a proper view. Whatever that felt like, you were used to the efforts took to see things. Now compare that to your vision with the glasses, clear, sharp and requiring no effort. But when you take off your eyeglasses after you get used to the clear and effortless vision, the struggle for vision returns, but this time, seems worse. Though kids don't like to wear glasses and think these make them look like geeks or are dorky, it is very important that they get the right glasses and wear them if their eyesight is weak. Wearing the wrong glasses or not wearing glasses have long term effects on the vision. Short sightedness in children was under corrected in the past because it was thought that giving a lower number could slow down the progression of myopia. This practice was proved to be wrong. A study was conducted on 94 children in 2002. Some of them were given the correct lenses and others were given a lower number and the vision was under corrected. Their eyeballs were measured yearly. It was noted that the kids with under corrected vision had more elongated eyeballs meaning that their eyesight was getting worse. The practice of under correcting the vision for kids is no longer considered. Why Do Your Eyes Seem Weaker after Wearing Glasses? 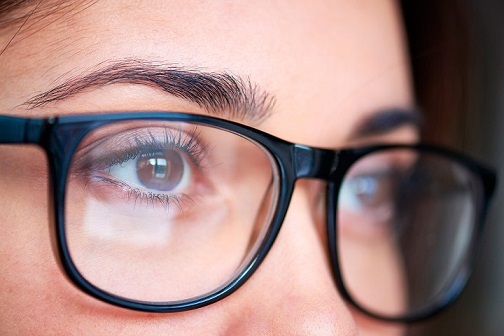 Do glasses make your eyes worse? It looks like so, but is not true. Human body is extremely adaptable, just imagine that you have a very heavy backpack tied to your back and you need to do everything while carrying it. After sometime you will get used to having it and your body will learn how to perform, and soon you will barely notice that burden on your back. Same is true for a weak vision. Your eyes get adjusted and learn to see things as best as they can. Then one day, someone removes that backpack and it is only then you realize that how easy it is to do things without that load on your back. This is exactly what happens when you wear the right glasses for the first time, the vision becomes sharp and clear and it is no more a task. So you go on without that backpack for a few weeks and then decide to lift it again. It feels heavier because your body is no longer used to it. If you take off your glasses, the same thing happens, your eyes are not used to seeing the blurred picture and the sudden change is very noticeable. That does not mean your eyes have gotten worse, it means now you can appreciate the contrast more precisely. Glasses are a gadget for proper vision, you need specific tools to perform specific tasks and these glasses are your tool to see clearly. Now that you know the answer to "Do glasses make your eyes worse?" here are a few more myths that need to be clarified. Myth 1: Reading in poor light makes the eyesight weak. The truth is reading in dim light cannot damage your eyes. Before the invention of electricity, people used to do all night time activities like reading or sewing in candle light which was very dim. Proper light is recommended to avoid strain on eyes but it does not mean that reading in dim light will damage your eyes. Myth 2: Holding a book close to eyes or watching TV from very near can damage the eyes. This will not damage your eyes, many children hold the books close to their face due to habit and it is not harmful for the eyes and the eyesight would not get worse by doing so. Myth 3: If you use your eyes too much, they will wear off. The main purpose of eyes is to see and there is no evidence that using them for this purpose can damage them in any way. Myth 4: Wearing wrong glasses can damage your eyes. The purpose of glasses is to change the way light enters in the eye so a clear vision is formed on the retina. Wrong glasses can lead to blurred vision or headache but they will not affect the eye in any other way. In children it is crucial to get the right glasses because the eyes are still growing. Myth 5: Crossing eyes can make them permanently crossed. This is not true. The eye muscles are capable of moving the eyeball in all directions, cross eye is a result of damage to the muscles or nerves or due to severe refractive error. Crossing them voluntarily does not make them cross permanently. Myth 6: 20/20 vision means perfect eyes. Yes, 20/20 vision is excellent and means that the central vision is perfect but there are many eye conditions where the central vision remains perfect and the peripheral vision is severely damaged. A 20/20 vision does not guarantee that there is no damage to the peripheral vision.